Alright, this sounds like a motley combination, doesn’t it? The truth is, however, that there are few flavor combinations from Scandinavian nature that complement one another as well as salmon and nettle. The flavors are serene and earthy. This is real comfort food without the hangover. A more usual green partner to salmon is spinach, but if you take the trouble to pull on the garden gloves and harvest the nettle growing around the compost at about this time of year, your efforts will be more than well-rewarded. To use in cooking, prepare the nettle by removing the thickest part of the stalks, as well as cleaning out any grass and soil that has come along in the picking. Blanch the nettle by plunging it into a pot of boiled water for a couple of minutes. Drain the water and once the nettle has cooled, squeeze as much water out as possible, forming the nettle into a green ball. Chop it up and freeze or use immediately in cooking. Here is a fine recipe that family and friends will enjoy on these warming spring nights. Preheat the oven to 190 C or 374 F. Line a casserole dish with the butter dough. Distribute the nettle across the dough evenly. Season with salt and pepper. Follow with a layer of mozarrella. Season the salmon with lemon, salt and pepper. Lay the long fillets on top of the other layers. Decorate with tomatoes in between the fillets. Season all with salt and pepper. Drizzle olive oil on top. Bake for 20 minutes. Serve with a green salad. As I sauntered past my compost container yesterday, I noticed the first tender leaves of nettle forming small umbrellas over the rich soil. Although it is a bit of work, this is the best time to clip away a liter (a quart) or two for preparing that iron and calcium boost you need this spring. So, if you’ve got some nettles starting to grow in your vicinity, pull on the gardening gloves and clip away as much as you can (no need to worry about it not growing back – it is a very determined plant!). 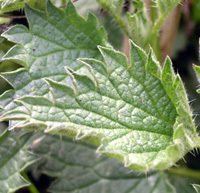 In Scandinavia, nettles are a main feature of spring cuisine. Every newspaper and magazine in April is running its own nettle soup and other prickly green recipes. I remember sitting in the offloading room of a major restaurant in Stockholm in April and gaping at a local who had just walked in with several crates of nettles. The man who had leather hands declared that he never picked with gloves on! I’m starting with my favorite nettle recipe which isn’t the typical nettle soup (that’s next). If you haven’t got nettles you can use baby spinach leaves instead. Preheat your oven to 200 C or 392 F. Mix the dough ingredients in a food processor until they clump together in a thick sausage shape. Roll out in between two sheets of baking paper (so as to avoid the dough sticking to the counter and the rolling pin). Scatter a bit of extra flour onto the bottom sheet of baking paper before rolling out to avoid stickiness. Remove the top sheet of baking paper and turn the dough into the pie dish, peeling away the other layer of baking paper once the dough is nice and flat in the pie dish (ca. 11 inches or 28 cm). Cut away any extra dough that hangs over the edges. Sounds complicated but it’s actually very simple once you get the hang of it! Place the pie crust in the oven and allow to bake for 7 minutes. Remove and set aside. Now to the nettles. Brush off any soil. Pluck the leaves off the stems, place in a pan with just a few tablespoons of water and gently bring to boil. Let boil for only a minute or until you see the leaves wilting. Place in a collander and press all of the water out of the nettles. Roll into a ball and press more water out. Cut the nettle mass into fine strips. Saute the onion for two minutes over medium heat. Do not let them brown. Remove from heat and blend in the nettles. Beat the eggs and blend with creme fraiche, a pinch of salt and a turn of the pepper grinder. Assemble the pie. Cover the base of the pie with the nettle and onion mixture. Crumble feta or other goat’s cheese on top. Pour the creme fraiche mixture over the contents of the pie and cover evenly using the back of a spoon. Ready for the oven! Bake for 25 minutes or until the pie is lightly browned on top. Serve with red currant or other fruit jelly of your choice. If you are enjoying this as a main dish you can also serve it with some cold meats and almost any type of salad.